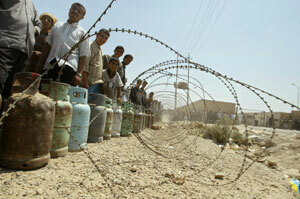 Iraqis stand in line to refill cylinders of cooking gas ata station in Baghdad, July 15, 2003 (Photo: Marwan Naamani/AFP-Getty Images). Nights are quiet in Baghdad. Every few hours a patrol of armored vehicles clanks down empty streets and there is an occasional crackle of gunfire. But most of the city, without electricity, turns restlessly, sweats, and waits for the few hours before dawn when it is cool enough to sleep. But when light breaks, the silence is shattered. Traffic pours onto the roads, in the poorer areas the bazaars are busy, on the richer streets new satellite dishes and fridges line the pavements. The restaurants are full, men sit out on the street drinking tea, boys play football beside the Tigris, the university campus is full of students sitting their finals. But the political realities of life are never far away. From first light, American helicopters swing over burnt-out ministry buildings, over the teeming slums of the north of the city, and over the sprawling Republican Palace, where beneath domes topped with 30-foot busts of Saddam Hussein the Coalition Provisional Authority (CPA) is based. On the southwestern horizon, two plumes of smoke trail from Baghdad’s main power station’s four chimneys. There is little to show that the country is on the brink of an insurrection. But then it isn’t. Every day news bulletins across the world are led by the latest violent incidents from Iraq. On Thursday the gunner of a Bradley armored vehicle was shot dead. On Friday, following a mortar attack on a nearby base, 11 Iraqis were killed in a series of firefights. Total U.S. and U.K. combat casualties since May 1, when George Bush declared the end of the war, are 31. Lt.-Gen. Ricardo Sanchez, commander of the U.S. forces in Iraq, said last week that there were an average of 13 “contacts” each day. But this, he said, did not bother him. The general’s blithe confidence may jar with many, but his appraisal of the military situation is accurate. Gleeful reports suggesting a new Vietnam are, at least currently, simply wrong. They founder on the basic fact that the vast majority of the Iraqi people, if not supportive of the U.S. and British occupation, are still far from being actively opposed to it. Talking about “the Iraqi people” is a fraught business. There is no such thing as a unified “Iraqi voice.” After 30 years of Saddam, the country is full of loudly expressed opinions. In the past month, I have heard everything from “I love the U.K. and the U.S. from the bottom of my heart” (from a Shiite activist in the holy city of Najaf) to “You are dogs and will die like dogs,” which, accompanied by mock canine howls, made an evening spent in an American army post in Ramadi, 70 miles west of Baghdad, a distinctly unnerving experience. There are, however, certain shared concerns. The key ones are power, health care, security, and the unfolding political process. Electricity is described locally as the “beating heart of Iraq.” At the moment the administrators are trying, without success, to resuscitate it. In the first two weeks of June, the last period for which figures are readily available, power provision to Baghdad actually fell, from 1,300MW to 800MW. Without electricity, there is no light, sanitation, water purification, irrigation, manufacturing capability, and as everyone here keeps saying, sleep. The rich—and journalists, nongovernmental (NGO) workers, and CPA officials—have generators. Most simply sweat. But there are important nuances that are easy to miss. Before the war, Baghdad, where the complaints are loudest, received the lion’s share of the country’s electrical output. Saddam directed resources to those who were most loyal to him, particularly the Sunni tribes of the capital’s hinterland and the parts of the city where his support was strongest. In the Shiite-dominated countryside to the south, farmers could irrigate their fields for only an hour a day. Now they get 12 hours of supply. Villagers in Abu Ala, where searches by the British army led to the firefight in which six Royal Military Police (RMP) died 11 days ago, said that they got six hours’ electricity a day, before and after the fighting. “We are poor people, nothing changes,” Ali Jabbar, 34, declared. With health care, the situation is similarly mixed. Dr. Adel Mirza Ghadban runs an emergency hospital in Sadr City, the sprawling, rubbish-strewn, Shiite-dominated suburb of Baghdad. People here have little, and the knowledge that their country has the world’s second-biggest oil reserves keeps resentment keen. Ghadban said that the recent influx of NGOs to Baghdad, the end of United Nations sanctions, and the opening of Iraq’s borders now meant the hospital had a good supply of drugs. Treatment is cheaper, too, Ghadban said. But a few miles away is what once was the Saddam Children’s Hospital. When I first visited Baghdad in 1999, the government minders took me, as they took every reporter, to see the children who, they said, were dying because of sanctions stopping the import of key medicines. I was shown a small boy in intense pain and only hours from death. Last week the children were still dying. Saif Fallah, aged 6, lay on a filthy, stained bed in a foul-smelling ward. His grandmother flicked flies from the blood running from his nose and eyes. A year ago the boy was diagnosed with acute lymphoblastic leukemia. By combining various drugs, the doctors were able to help him fight the disease into remission. But the war interrupted the therapy, he relapsed, and now there is little chance, without new and more effective medicine, that he will survive. The priority for most Iraqis is security. Although a foreigner driving around Baghdad does not feel threatened in the way he might in Mogadishu, Johannesburg, or parts of Washington, locals are frightened. The looting in the immediate aftermath of the war has now evolved into more organized criminality. There are still 10 gunshot wounds treated each night in Ghadban’s hospital—down from 30 or more each day two months ago. But before the war, with the state’s monopoly on violence rigorously enforced, they never saw any such wounds. Now, in Baghdad and in the southern port city of Basra, nights are punctuated by automatic gunfire. Those police not purged by the postwar de-Baathification are not motivated, respected or, often, paid. Few of the 40,000 criminals released by Saddam in the last days of his rule have been caught. Though in some parts of Iraq religious groups or local community leaders have provided makeshift law enforcement, there has been a massive increase in crime almost everywhere. Carjacking and sexual violence are now widespread. Extortion is a growing business. The victims include many of those who are needed to get the country running again. All these issues meet in the vexed question of governance. Again, among the variety of views expressed, there are some general themes. One is a wish for a swift departure of the coalition. “We are happy for what they have done for us, but we want the British and Americans to go soon,” said Ahmed Younis, a former policeman in Mahmudiya, 50 miles south of Baghdad. Another almost universal sentiment is horror at the idea of a return to Saddam’s regime. A third is a profound desire for a swift transition to local rule. On the wall of the police station in Majar Kabir where the six RMP died was a hastily produced poster. “We want a government that represents all Iraqi people, a government which has an independent will,” it read. Partly the reaction to the occupation is an emotional one—and this explains Iraqis dancing on the roof of Humvees destroyed in ambushes. “No one likes to have their country invaded and their army defeated, even if it was for a good reason,” a former soldier who deserted during the war told me as he watched yet another U.S. patrol drive past in Ramadi. Like many, he said he would prefer to be governed badly by Iraqis than governed well by foreigners. The British and the Americans talk about the “rejectionists” who are behind the attacks on their troops. But, in a sense, the whole country is rejectionist. That does not mean they endorse violence against their occupiers, but it does mean they want them to leave as soon as possible. Most talk about allowing their occupiers three or six months. For their part, coalition officials and Western diplomats talk of leaving in around two years. The gap is likely to be a serious problem. At the CPA’s Baghdad base, Gurkhas stand guard outside the marbled halls where officials tap at computers under Saddam’s chandeliers. The de-facto governor is Paul Bremer, a workaholic American businessman with neo-liberal ideas and a can-do attitude. Bremer has shelved elections on the grounds that, with no census, no polling machinery, and no time for new moderate parties to organize, their results would be unrepresentative. Instead, within two weeks Bremer will appoint a “governing council” of 30 Iraqis to advise him on key decisions, to provide “ministers” to work alongside CPA officials, and to help organize a “constitutional conference” to determine the future political institutions of Iraq. But all this takes time. And time is what the CPA lacks. Bremer and his people have been trying to run and reconstruct an entire country. It is an enormous task that few anticipated. Prewar planners expected a major humanitarian crisis, not a complete failure of government. Now the CPA is trying to catch up, and although it is good on broad strategy, its ability to secure practical, visible improvements on the ground swiftly is often lacking. The result is that the slack has to be picked up by the NGO sector and by the military. At the moment the military is doing two jobs: eliminating resistance to allow the civil authority to complete its tasks safely, and helping with reconstruction work and maintaining law and order. But their twin tasks conflict. The murdered RMPs were there to train local police. Standing in the police station where they died, Abbas Baiphy, one of the trainees, had told me how the soldiers had been his “best friends.” Yet the RMPs died because other British troops had searched for arms caches. That incident occurred in the British-run zone in Iraq. The British have a justified reputation for careful peacekeeping. They are doing a good job in an easy area. The Americans are doing a poor job in a hard area. The U.S. military has limited experience of training for, or interest in, anything other than “war fighting.” Lt. Col. Ronnie McCourt, a British army spokesman in Basra, told me that the U.K. forces in Iraq “acted in a Western democratic way to bring Western democratic values.” A U.S. soldier in Fallujah described his job differently. “We kill people and blow things up,” he said. The U.S. is also hobbled by a latent Islamophobia that has been vastly strengthened since Sept. 11. An inability to discern moderate Muslims who can make a positive contribution was behind the decision to appoint a secularized, corrupt, and violent Sunni to power in Najaf. The U.S. appointee has now been deposed and arrested by the CPA—but only after near-riots. Resistance to the coalition is concentrated in the Sunni triangle, the area north and northwest of Baghdad that was Saddam’s tribal and political power base. These are the people, a fraction of the total population, who effectively ruled Iraq. They are the ones who have lost most in recent weeks. Elsewhere, attacks on U.S. forces have been limited. There have been none by Kurds, still ecstatic about the end of Saddam’s rule. The Shiites, also grateful, are also relatively peaceable. Those behind the continuing violence are thus a minority of a minority. There are 27 million Iraqis. Thirteen, or even 30, incidents a day, confined to a relatively small part of the country, do not make a national war of resistance. This is not cause for complacency. Expectations are as high as the summer heat. Many Iraqis are still prepared to give the coalition forces a chance. But the British and American governments turned over an hourglass when they invaded Iraq, and the fine desert sand is falling fast.